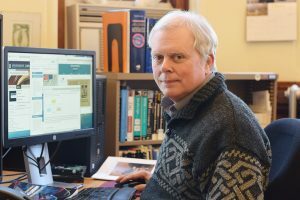 The University of Illinois at Urbana-Champaign was awarded a National Leadership Grant for Libraries from the Institute of Museum and Library Services (IMLS) to hold a national forum and develop a white paper aimed at simplifying scholars’ access to in-copyright and access-restricted texts for computational analysis and data mining research. A grant from the Institute of Museum & Library Services (IMLS) will allow four U of I librarians to create an online curriculum focused on policy surrounding library publishing groups. This team consists of Sara Benson, Copyright Librarian and Assistant Professor (project leader); Harriett Green, Interim Head of Scholarly Communications & Publishing and Associate Professor; Merinda Hensley, Digital Scholarship Liaison and Instruction Librarian and Associate Professor; and Janet Swatscheno, Visiting Digital Publishing Specialist. Timothy Cole, head of the Mathematics Library at the University of Illinois at Urbana-Champaign, has been named a recipient of the 2017 Frederick G. Kilgour Award for Research in Library and Information Technology. This award is sponsored by the Online Computer Library Center (OCLC) and the Library and Information Technology Association (LITA). University of Illinois efforts have led to the publication of three new technical standards for web annotation, which will allow linking and sharing of comments across websites. This effort was led by the W3C web annotation working group, co-chaired by Tim Cole, Mathematics Librarian and Professor, University Library, and Dr. Robert Sanderson from the J. Paul Getty Trust.